Tattered banners at the Old South Church entrance on Boylston Street are reminders of the bombings. On Boylston Street, at that very place, the daffodils at Old South Church have finally pushed through the mud in a burst of yellow. 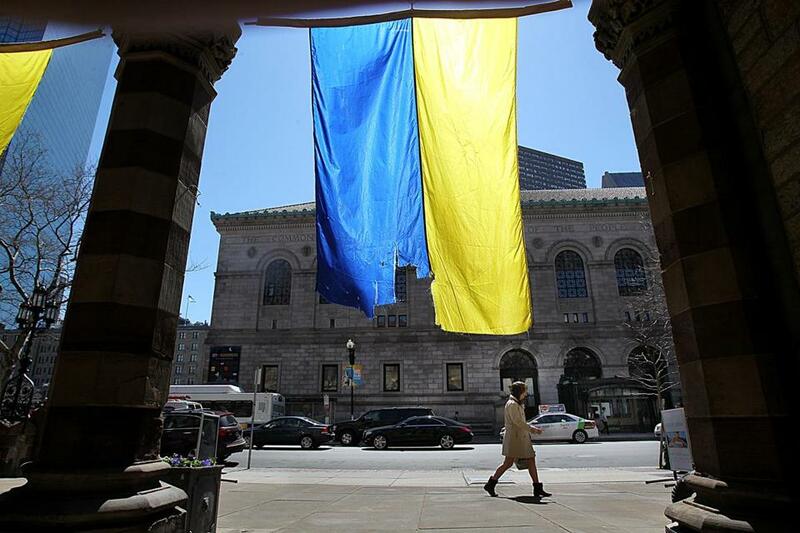 A few steps beyond, the city rushes by: professionals in tailored suits, customers testing shoes from the nearby Marathon Sports store, a man in a Boston Marathon windbreaker, because it is that time of year. Workers have scrubbed the orange crime scene paint from the brick and concrete, leaving the sidewalk astonishingly unblemished. But subtle reminders remain: a single pair of running shoes hanging in a tree, a knitted chain of hearts in Boston Marathon yellow and blue. The world’s most prestigious road race will be run again next week, as it has since 1897. A year after two explosions, four homicides, a manhunt, a gunfight, and a citywide comeback that is still unfolding, much about the city looks and feels as it long has, but nothing is really quite the same. One race spectator cannot stop shaking. An affable nurse who tied a tourniquet now avoids crowds. Bullet holes in a Watertown house are still stuffed with toilet paper. For those in the line of fire, and those who rushed to help them, the legacy of the year — the pain slowly fading, the strength slowly returning — is plain to view, part of the fabric of the history the city knows too well. But beyond that first circle of tragedy, lies a larger and deeper ring of people and places, marked in ways less obvious but no less real. Cesar Vazquez, for one, is back with the crew setting up the finish line scaffolding. It is an annual, repetitive task, but one that has to be done right. It feels different now. A year ago, they wore protective white outfits when they removed the scaffolding to avoid contaminating a crime scene. He has a 4-year-old boy at home in Woonsocket, and he thinks about the BBs and nails the crew found last year. Working near the finish line makes him nervous. “I’m not going to say I’m not scared,” he said. A year ago, Mary Hanlon, a nurse who loved being around lots of happy people, headed down Exeter Street toward the finish line, expecting to see a friend complete the race. The health care coordinator for the Boston Archdiocese felt the pavement tremble. It seemed nearly everybody was crying or screaming, except the most badly wounded, who looked oddly serene on the ground. She stopped to help a college-age woman with beautiful blond hair. The woman’s face was dirty and smeared with blood. A wound on her right leg had bled through her pants. Since the attack, Hanlon, 53, has avoided crowds. “Maybe the icebreaker will be to . . . go to this Marathon and see how I feel,” she said. Three floors above the finish line, shrapnel pierced a pane of glass at the office of Marlo Marketing/Communications. It was the sixth annual Marathon party at the public relations firm with an enviable view of the finish line. A frozen margarita machine churned. There was Narragansett beer for 150 attendees. Then, at 2:49 p.m., there was a sound that was at first hard to place. Fogelman’s friends warned her not to look at the scene below, but she could not help one glance. Marlo Marketing will host another finish line party this year, but the breeziness of the past is over. There will be security. People will not be able to just pop by. Last April 15, Dr. Tracey Dechert had just finished a 30-hour stint as a trauma surgeon in the emergency room at Boston Medical Center, an uneventful shift of car crashes and falls. She drove home to Beacon Hill at noon to eat and sleep. Hours later she was back in scrubs, rushing to work. She could not get near the hospital. There were too many ambulances, too many police cruisers. She parked blocks away and ran. Staff spilled out of the emergency room. Dechert pushed through the crowd, still wearing her coat and clutching her purse. “Where are we?” Dechert asked the triage doctor. This year has changed the busy surgeon, in a subtle way. One man in blue scrubs at the hospital that Monday was Roody Appolon, a housekeeper who cleaned operating rooms after the surgeries, preparing a place for the next patient. Typically Appolon uses a single mop. That day he needed three. At 38, Appolon is a proud man. He knows after 13 years at the hospital that doctors need a clean room for surgery. He dusted and disinfected. Then he did it all again. And he does it still, with maybe extra feeling. This year, Appolon has Patriots Day off. He plans to go to Back Bay for the Marathon. In the aftermath of that first day and first week, spontaneous memorials, displays of patriotism and civic pride cropped up almost immediately. Just two days after the attacks, Heather Yunger returned to Boston. She had heard the pop, pop of the bombs from blocks away. That Wednesday the 38-year-old from Quincy wanted to be where she felt most at home: Section 307, Row 12, Seat 9 of the TD Garden. She wanted to be with her Bruins and the family she developed after 15 years in Section 307. All the 307 long-timers were there: The professor from Cambridge, the lawyer from Arlington, and the contingent from Pelham, N.H. The draw was not so much the game against Buffalo. They wanted to be with their city for first major gathering since the tragedy. There was a photomontage from the Marathon, and a tribute to first responders. Then Rene Rancourt stepped onto the ice with his coiffed hair and tuxedo, began to sing the national anthem, and then let the 17,656 voices in the crowd take over. A year later, Yunger still sings the anthem with her Bruins family. But this month, she signed up to run in a relay race to raise money for Marathon victims. It’s a big change. Yunger has never been a runner. She has never even worked out. On Patriots Day last year, a teenage chorus singer named Zach Louissaint shot hoops with his friends at the Chinatown YMCA. That afternoon, they hopped the Green Line toward Copley Square, one of their regular hangouts, intending to watch runners cross the finish line. But the lights were off at Copley station and the train plowed straight through. The next 48 hours were chaotic for Louissaint, now 17, and his fellow singers from the Boston Children’s Chorus, as they performed four times at bombing memorials. The events culminated in an emotional performance at an interfaith service at the Cathedral of the Holy Cross. The audience included survivors, political and religious leaders, President Obama and Michelle Obama. The chorus was exhausted and emotionally wrung out. In a quick pep talk, artistic director, Anthony Trecek-King, told his singers to dig deep. In the first row of the choir, Meghan Fitton recognized the first notes on the piano. She heard Yo-Yo Ma’s cello. She stole a glance at her conductor and saw the tear on his cheek. Hers was the sobbing, captured on national television, standing next to a soloist. But when the full choir joined the ensemble, Fitton took a deep breath, and performed. A year later, Fitton remains proud of her small role in helping people heal. She has developed a great appreciation for her city, even if she lives in the suburb of Foxborough. Louissaint marks the year past in many ways. For one thing, he is an inch taller. He also now thinks in a different way. As the days and weeks passed, Nicole O’Neil knew something had changed every time she tried to get a cup of green tea. She wanted her regular drink from Zume’s Coffee House in Charlestown. But O’Neil couldn’t stay in the cafe, in a crowd, long enough to get her order. Her chest tightened. Her throat grew a lump. She could not breathe. Her body would begin to shake. “I would run out,” O’Neil said. She had been on Boylston Street on Marathon Monday, about 125 feet from Forum restaurant, where the second bomb detonated. She has jagged memories, incomplete images and feelings. After a sleepless year of therapy and panic attacks, the 34-year-old professional photographer still cannot stop shaking. Her right leg bounces like a jackhammer. The relentless shake rattles the charms on her Alex and Ani bracelet, even the Boston Strong trinket. O’Neil said her therapist has diagnosed her with post-traumatic stress. She has struggled intellectually coming to terms with her injury. The shrapnel missed; she didn’t bleed. But O’Neil still sometimes feels broken. She was always laid back, but became quick to snap. She had traveled to Italy and Ireland by herself, but now is afraid to fly. Therapy has helped. She has befriended bombing victims with physical injuries. She had found solace in work, steadying herself behind the lens of her camera. But the trembling intensified with the approach of the anniversary. “That tells me that there is a lot of bad energy . . . inside of me that needs to work its way out,” she said. At the Massachusetts Institute of Technology, a corner of campus will always be haunted by the assassination of school police Officer Sean A. Collier, three days after the Marathon. The suspected bombers allegedly sneaked up from behind and shot him as he sat in his cruiser. The spot is now marked by American flags, a wooden cross, and a stone bearing Collier’s badge number. Research scientist Charlie Whittaker has a “Collier Strong” sign taped to his office window, which overlooks the site of the shootings. A few miles from there, the Watertown Police Department has posted its own memorial plaque, at its station, listing the department’s roster as of April 19, 2013, the day local officers engaged in a gunfight with the alleged bombers. Two miles east, at the site of the firefight on Laurel Street, the bloodstain at the end of Jean MacDonald’s driveway is finally gone, and the stop sign pockmarked by bullets has been replaced. But subtle signs of the battle remain. One homeowner has filled six bullet holes in his house with toilet paper, while he ponders whether to continue living in the building. Another left the bullet holes alone, thinking they may add mystique and increase the home’s value. Alleged bomber Tamerlan Tsarnaev, fatally wounded, ended up at the end of MacDonald’s driveway, after being dragged beneath a getaway car driven by his brother and alleged coconspirator, Dzhokhar. A year later, reporters and tourists still visit the scene. “Laurel Street will always be well known,” MacDonald said. The Tsarnaev family is long gone from their third floor apartment on Norfolk Street in Cambridge. In the front yard, there remains a trellis that Tamerlan used as a pull-up bar. The grape vines are brown and bare. Meanwhile, back in Hopkinton, where the race begins each year, the annual rites of spring have resumed for Peter Curry, a historic preservation specialist. He wore rubber gloves to buff the weathered bronze of the memorials on the Hopkinton town common, so they will make a sparkling impression on the most important day of the year. During a break he wandered from his tools to the edge of the yellow and blue line painted on the road, raised one hand, and held the pose of “The Starter,” a statue on the town common honoring George V. Brown, who fired the starter’s pistol for more than 30 Boston Marathons early last century. “It’s pretty much business as usual out here,” Curry said. Patients healed in the weeks after the bombing. When they were well enough to leave Boston Medical Center, the hospital staff lined the hallway like an honor guard to say goodbye. There were doctors and nurses, of course, but the farewell also included housekeepers, social workers, staffers who delivered meals, and administrators. The hospital and eight others in Boston had performed a thousand little acts of kindness that had nothing to do with medicine. Hospital social work supervisor Amanda Wright took away this lesson: The tragedy showed that, for those not in position to provide direct care, seeing to the little things, the concrete needs – a bottle of water, a cellphone charger, a parking pass – can sometimes be the best way to support trauma victims and their families. The humanity, in the end, is in the act of doing.